give you the Book for free. "Theres always going to be information on the Internet that cant be found using search engines. When you look at LinkedIn, you have a highly structured database, or Rolodex®, of information which can be used in a much more organized way. A lot of times the privileges of membership allows you access to information that wouldnt normally be publicly available." How using LinkedIn effectively can turn what would once have been cold calls into warm calls, with door-opening introductions and third party endorsements. Thou shall remember recruiting is a contact sport. Thou shall not get seduced by Technology. It is a tool, not a crutch. If you still need convincing, click on this page to see some of the contributors and listen to a segment of their interview. "Happy About LinkedIn For Recruiting"
"Reading Happy About LinkedIn for Recruiting was like having a conversation with 100 Different industry professionals all at the same time. This is the definitive guide for recruiters looking to utilize all that LinkedIn has to offer." "Having created the first job board on the Internet and watching/supporting the industry as President of Monster and now as Executive Director of Direct Employers Association, I have a broad view of the overall recruiting marketplace. If you are a recruiter today, you should be using LinkedIn as one of the tools in your arsenal. If you are using LinkedIn as a recruiter, you need to read this book to pick up some of the hidden nuggets that often take months, if not years to unravel." "If the primary goal of recruiting and search professionals is to cash fee checks from happy clients - and it is - then 'Happy About Linked In for Recruiting' is a tremendous leap forward in making that happen. This book and the use of LinkedIn is truly an innovation in recruiting!" "The 'Happy About LinkedIn for Recruiting' book has been incredibly helpful in both finding alternate ways to recruit, as well as refining our recruiting process." "Bill Vick is a visionary who has been on the cutting edge of technology his entire career. 'Happy About LinkedIn for Recruiting' is another example of Bill developing a tool that will turbo charge your recruiting and marketing efforts. LinkedIn allows you to develop rapport and relationships with individuals who will dramatically increase your ability to reach levels of top production. It is important today to utilize cutting edge tools available, in order for you to "stand out from the crowd." "I picked up a copy of the book and it is AWESOME! It is geared towards recruiters and gives us tips on how best to use LinkedIn. I highly recommend everyone buying a copy." "It is a great read, I am actually on my second go around." "LinkedIn is a phenomenal tool for business networkers, job seekers, and recruiters alike. Everyone has different objectives behind the networking they do. Bill Vick's book is a fantastic resource for any recruiter who wants to understand how to get the most out of LinkedIn. The book's value isn't limited to recruiters however. 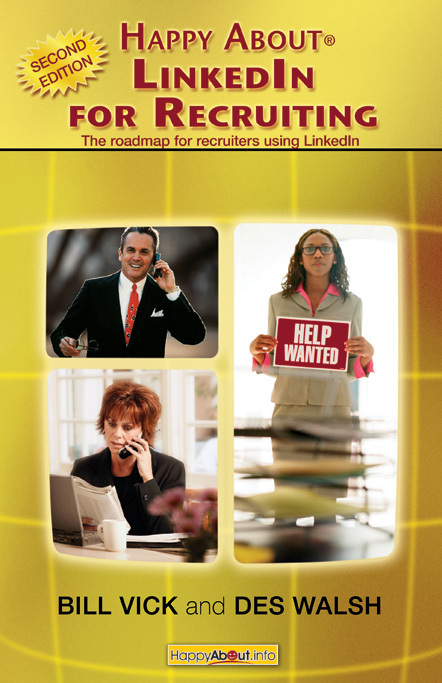 The book is also a great resource for job seekers desiring to maximize their exposure to opportunity by understanding how recruiters utilize LinkedIn to identify great candidates, in addition to having obvious applicability to business networkers in general." - Ron Bates, Managing Principal, Executive Advantage Group, Inc. and #1 most connected person on LinkedIn. "You can be sure that in my role as President of the National Association of Personnel Services (NAPS) I will be recommending our members to get LinkedIn and to read and listen to this book." From its inception, I knew that if Bill Vick were to get involved, 'Happy About LinkedIn for Recruiting' would be a successful book project. Bill pulled out all the stops to interview top recruiters and sourcing professionals in the staffing industry to get their take on best practices for Recruiters who are looking to maximize the value of LinkedIn in their daily business lives. I haven't really added up the numbers for the 7 bonuses that come with the book but, it appears that if an astute Recruiter purchased the book and used all 7 bonuses, they could make at least 10 times the cost of the book from the bonuses, alone. Of course, they could make MANY times that were they to put the book into practice. Because there are many Recruiters on MLPF and a number of others who might benefit from a close reading of 'Happy About LinkedIn for Recruiting', I'm happy about recommending it to you, your staff, and all members of My LinkedIn Power Forum. Kudos to Bill and Des for a job well done!" LinkedIn is a great tool! Whenever you start a search, the hardest part is, you know, starting. Where do you find them? Who are the people you need to talk to? LinkedIn is a great tool for primary sourcing. Its a great tool for trying to break into a company to find out who to talk to. Because even if the perfect prospect is not directly in LinkedIn, one of their co-workers probably are." Bill Vick (LinkedIn profile) spent his early career in executive sales and marketing management with F500 companies focusing on the consumer products industry, computer retail and software industries. He joined Management Recruiters International in 1986 as a recruiter where he was their National Rookie of the year. Subsequent to that, Bill ran his own retained search firm, Vick & Associates which he still maintains. He was a founder and board member of the Pinnacle Society recognizing achievement in the staffing industry, a national speaker for National Association of Personnel Consultants (NAPS), served on the Board of Directors of The Texas Association of Personnel Services (TAPS), was an officer with the Metroplex Association of Personnel Services (MAPS) and a founder of the local Dallas Independent Recruiters Group (IRG). He is an active speaker, and writer on career issues, recruiting trends and employment technology. Des Walsh (LinkedIn profile) is a business coach and blogging evangelist, with lengthy experience as an executive and consultant in both the public and private sectors. He has authored or co-authored reports and manuals, in diverse fields from government policy in education and the arts, to training manuals for executives in the transport industry. Des is currently a business coach and specializes in supporting business owners wanting to make effective use of blogging and other social networking tools. He is a founding member of the International Association of Coaches and a member of Coachville.com. A member of several LinkedIn groups, Des is moderator of the LinkedIn Bloggers group.